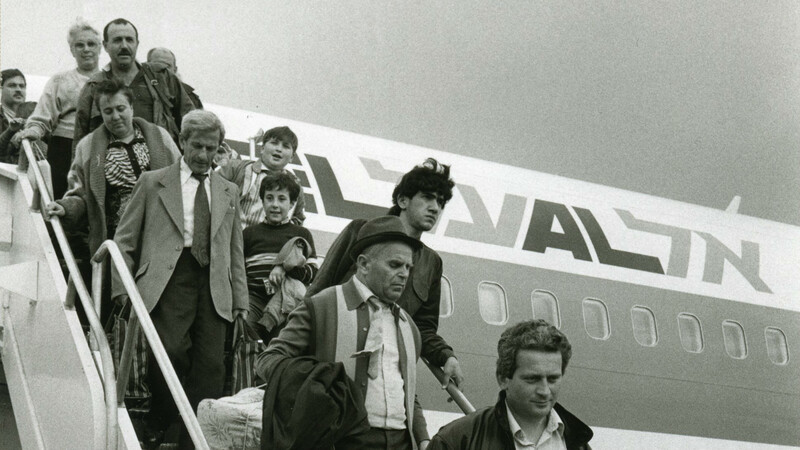 The First Aliyah brings an estimated 25,000-35,000 immigrants to Palestine, the majority of them fleeing anti-Jewish pogroms in Eastern Europe. French Jewish army officer Alfred Dreyfus is wrongly convicted of espionage. The case has a galvanizing effect on the development of Zionism by underscoring the precariousness of Jewish life in Europe. Theodor Herzl, an Austro-Hungarian journalist who covered the Dreyfus trial as a correspondent, publishes Der Judenstaat (“The Jewish State”), in which he proposes the creation of a Jewish state as the solution to anti-Semitism. 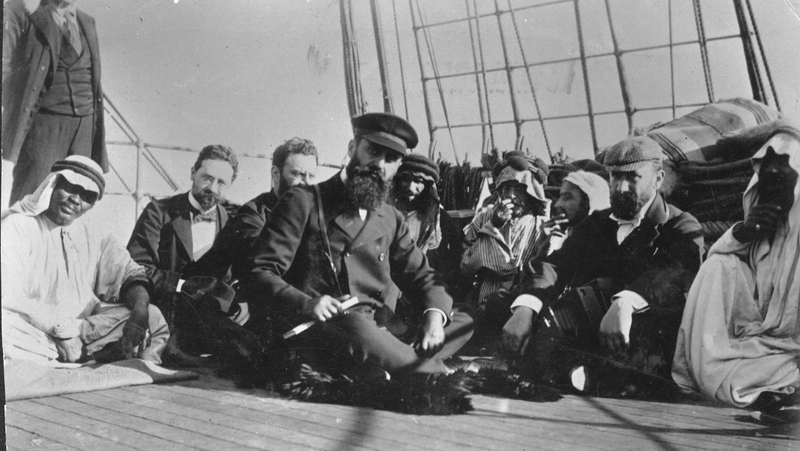 Herzl convenes the First Zionist Congress in Basel, Switzerland. 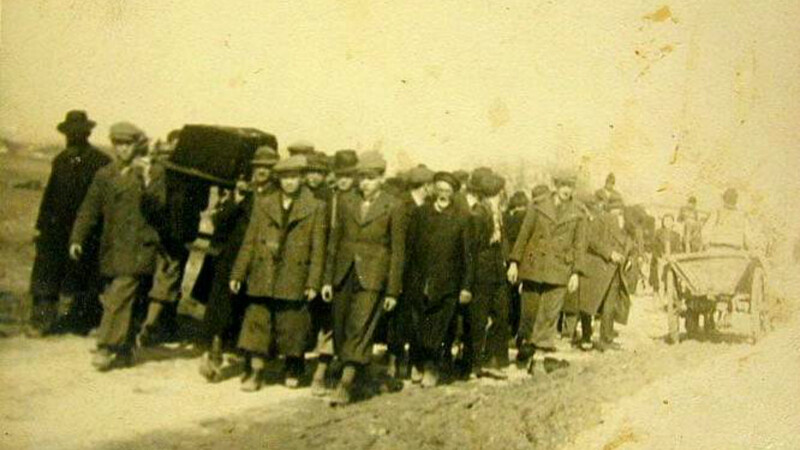 The Kishinev Pogrom in the Russian Empire, in what is now Moldova, kills dozens of Jews and results in the destruction of hundreds of homes and business, prompting tens of thousands of Russian Jews to flee to Palestine. Tel Aviv, the first modern Jewish city, is founded on the eastern shore of the Mediterranean Sea. 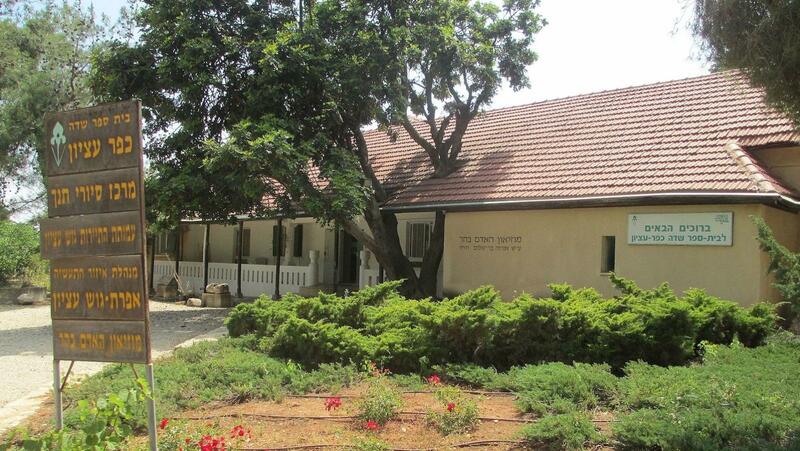 Eliezer Ben-Yehuda begins publishing the first Hebrew dictionary, hastening the revival of the ancient language. Britain issues the Balfour Declaration, endorsing the establishment of a national home in Palestine for the Jewish people. 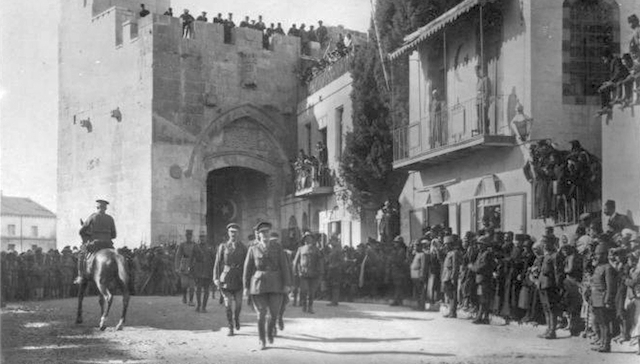 The Armistice of Mudros ends World War I in the Middle East and begins the breakup of the Ottoman Empire, which had occupied Palestine since the 16th century. 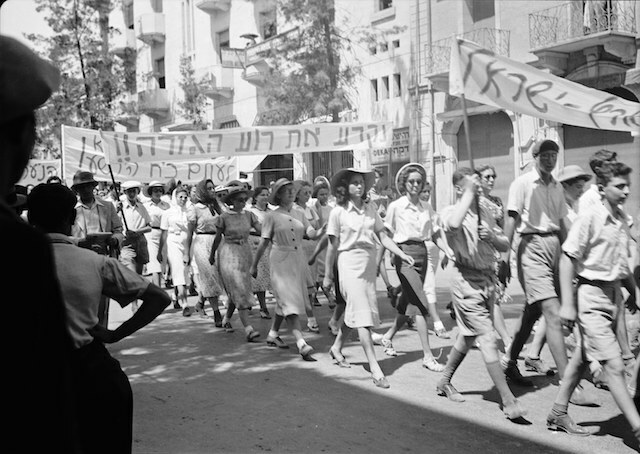 The Haganah is founded as an independent defense force for Jews in Palestine. The League of Nations adopts the Mandate for Palestine, granting Britain temporary authority over the territory. Palestinian Arabs kill dozens of Jews and wound scores more in what will come to be known as the Hebron Massacre. 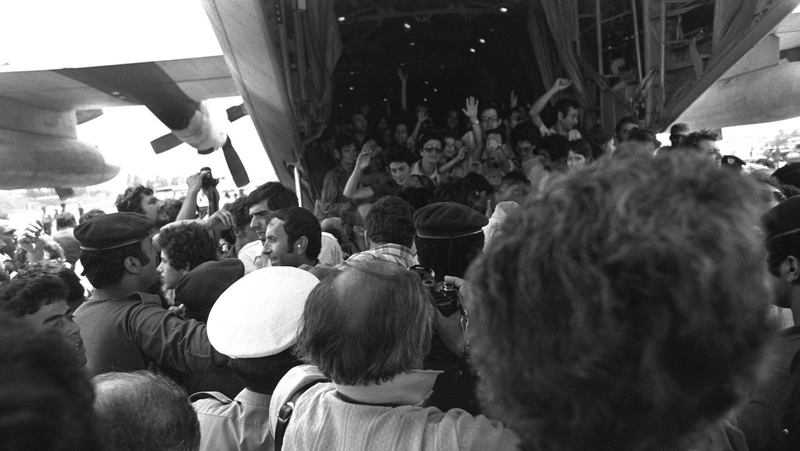 The Fifth Aliyah begins, bringing over 200,000 Jews mainly from central and eastern Europe to pre-state Israel over the course of the decade leading up to World War II. Driven in large part by the Nazi rise to power in Germany in the early 1930s, the large numbers of new arrivals exacerbate tensions between Jews and Arabs. Palestinian Arabs revolt against British rule, demanding Arab independence and the end of Jewish immigration. The British House of Commons approves the White Paper of 1939, which severely restricts Jewish immigration to Palestine at precisely the moment when the Nazi rise to power is prompting growing numbers of European Jews to seek refuge there. The Haganah creates an elite fighting force called the Palmach to protect the local Jewish community. The United Nations votes to partition Palestine into two states, one Jewish and one Arab. Zionist leaders agree to the plan, but the leaders of several Arab countries and of the Palestinian Arab community reject it, leading to intercommunal clashes that ultimately develop into a full-blown civil war. Anger over the partition vote prompts rioting in Jerusalem that claims more than a dozen lives. The fighting marks the beginning of the Arab siege of Jerusalem, which seeks to cut off the 100,000 Jewish residents of the city from the rest of the country. More than 100 Arabs, including women and children, are killed by Jewish fighters in the village of Deir Yassin. 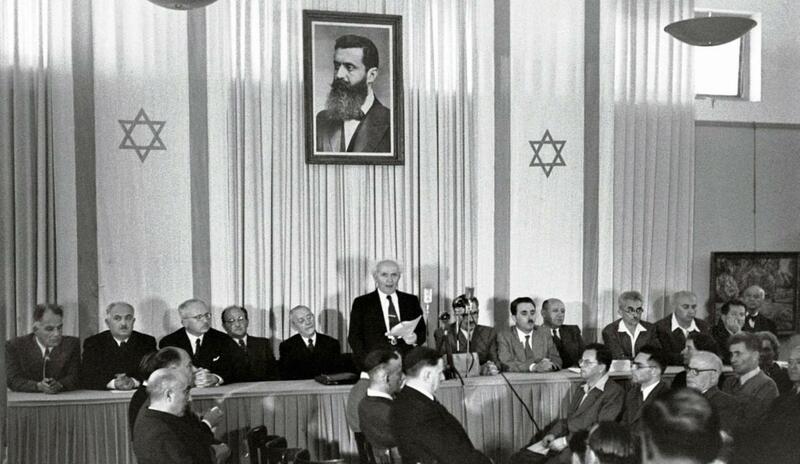 David Ben-Gurion proclaims the establishment of Israel in a ceremony in Tel Aviv on the day the British officially end their rule in Palestine. The following day, Israel is invaded by the armies of five Arab states, beginning the War of Independence. An armistice agreement is signed between Israel and Egypt, formally ending hostilities. Israel signs similar agreements with Jordan, Lebanon and Syria in the months to come. Israel is admitted as a member state of the United Nations following a vote of the General Assembly. 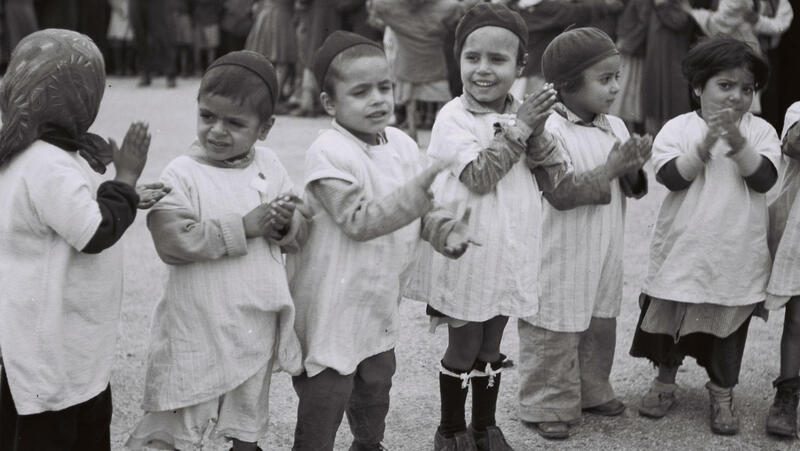 Israel launches Operation Magic Carpet, which brings tens of thousands of Yemenite Jews to the Jewish state. Hundreds of thousands of Middle Eastern Jews will eventually resettle in the Jewish state, driven by mounting persecution and expulsion prompted by Israel’s establishment. More than two-thirds of Jewish displaced persons in Europe also arrive in the Jewish state between 1948 and 1951. Israel invades Egypt as part of a secret pact with France and Britain, prompting intense international criticism that eventually leads the three nations to withdraw. Israel’s nuclear reactor at Dimona begins operations. Israel has never formally acknowledged that the reactor produces weapons materials, but the country is widely believed to possess nuclear weapons capacity. 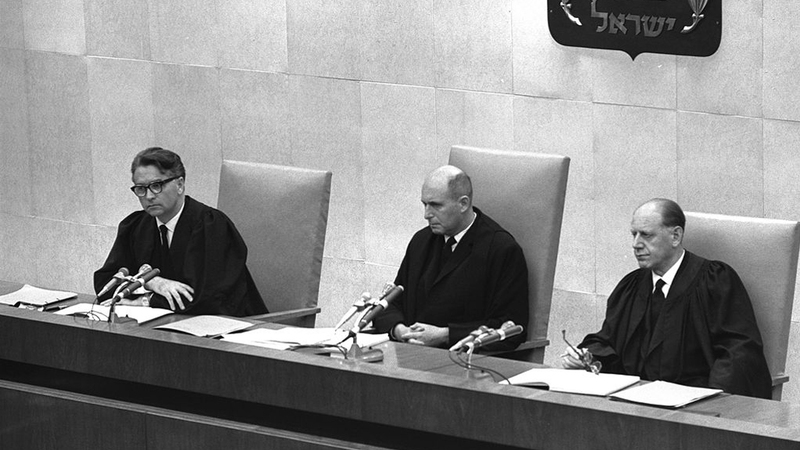 Adolf Eichmann is executed after having been found guilty by an Israeli court of crimes against humanity. The trial marks a turning point in Israeli discussion of the Holocaust and prompts many Holocaust survivors to speak of their wartime experiences for the first time. The Six Day War begins. In the course of the war, in which the Jewish state’s survival is threatened by forces of five Arab armies, Israel vastly expands the territory under its control, seizing the Gaza Strip and the Sinai Peninsula from Egypt and the Golan Heights from Syria. Israel also reunifies Jerusalem after capturing the city’s eastern half and the West Bank from Jordan. The Arab League issues the Khartoum Resolution with its famous “three no’s”: no peace with Israel, no negotiations with Israel and no recognition of Israel. 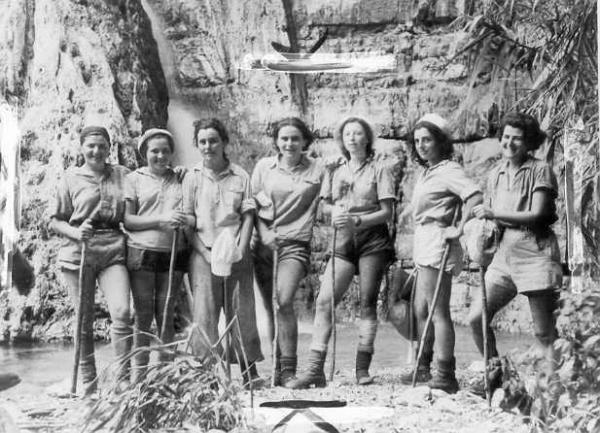 Construction begins in Kfar Etzion, an Israeli community in the West Bank destroyed in the 1948 war and re-established following the Six Day War. The construction sets off decades of Israeli settlement building in the territory that most of the world considers illegal. In a unanimous vote, the U.N. Security Council adopts resolution 242, calling for Israeli withdrawal from territories occupied during the Six Day War and respect for the rights of all states to live in peace and security. That formula — land for peace — will form the basis of Arab-Israeli peacemaking efforts for decades. During the Summer Olympics in Munich, Palestinian gunmen sneak into apartments housing 11 members of the Israeli team, taking them hostage and eventually killing them during a failed rescue operation. The Yom Kippur War begins when a coalition of Arab states launches a surprise attack on Israel on the holiest day of the Jewish calendar. Israeli commandos mount a successful rescue operation at Entebbe Airport in Uganda, freeing over 100 hostages taken after the hijacking of an Air France flight from Tel Aviv to Paris. Egypt’s Anwar Sadat becomes the first Arab leader to visit Israel, meeting with Israeli Prime Minister Menachem Begin and addressing lawmakers in the Knesset. 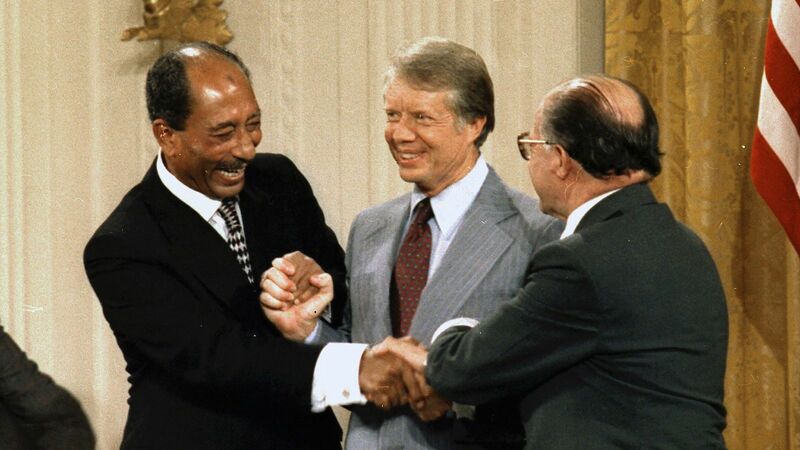 Israel and Egypt sign the Camp David Accords after days of negotiations brokered by U.S. President Jimmy Carter. The agreement leads to awarding of the 1978 Nobel Peace Prize to Israeli Prime Minister Menachem Begin and Egyptian President Anwar Sadat and to the 1979 signing of Israel’s first peace treaty with an Arab state. Israel invades southern Lebanon in an effort to stop attacks on civilians in northern Israel, resulting in the expulsion of the Palestinian Liberation Organization from Lebanon. Christian Phalangists begin massacring hundreds of Palestinian refugees in Lebanon in what becomes known as the Sabra and Shatila massacre. 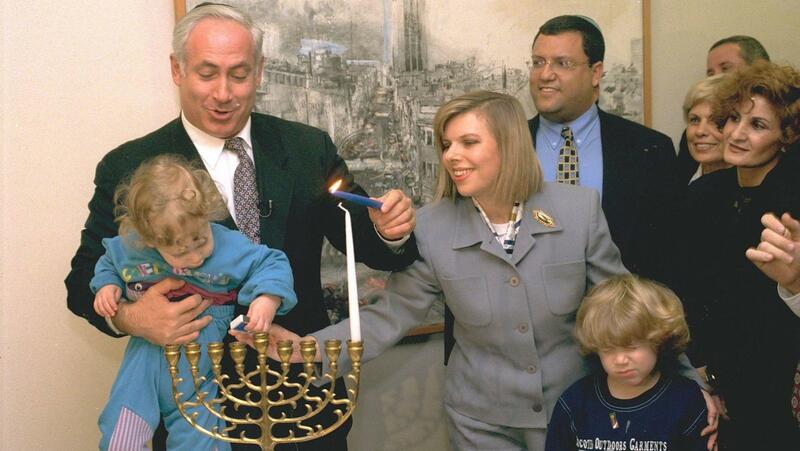 An Israeli governmental commission will later find Defense Minister Ariel Sharon indirectly responsible for the killings. 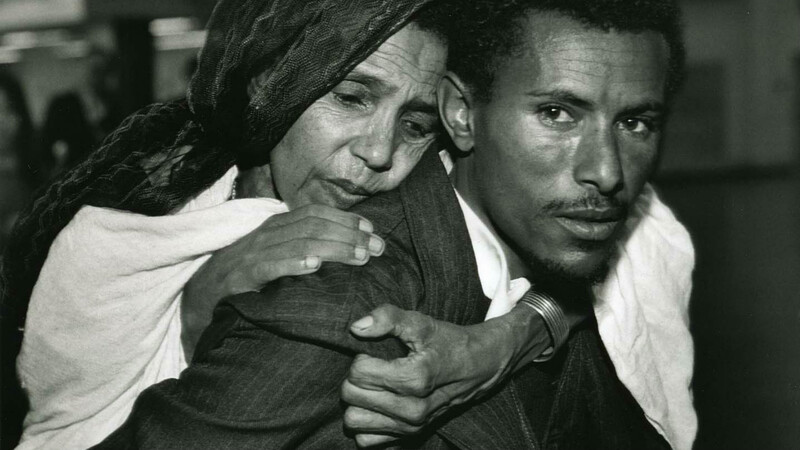 Israel launches Operation Moses, the covert evacuation of thousands of Ethiopian Jewish refugees from Sudan. Protests erupt in a Palestinian refugee camp in the Gaza Strip, setting off the violent uprising that comes to be known as the First Palestinian Intifada. Iraq launches the first of dozens of missiles at Israeli in response to U.S. bombardment during the Persian Gulf War. Several dozen Israelis die in the attacks, the majority from heart attacks and suffocation due to difficulties managing gas masks. Israel launches Operation Solomon to transport over 14,000 Ethiopian Jews to Israel over the course of just 36 hours. The Madrid conference opens in an effort to kickstart Israeli-Palestinian peace negotiations. The United Nations rescinds its 1975 declaration equating Zionism with racism. The Soviet Union is dissolved, prompting a massive wave of Jewish immigration to Israel from Russia and the former Soviet republics that will forever alter the country’s demographics. Israel and the Palestinians sign the first Oslo Accord at the White House, creating a framework for the peaceful resolution of the Israeli-Palestinian conflict. The agreement provides for the creation of an interim Palestinian self-governing authority and for the withdrawal of Israeli soldiers from certain Palestinian territories. In a rare act of Jewish terrorism aimed at Arab civilians, Israeli settler Baruch Goldstein opens fire at the Tomb of the Patriarchs in Hebron, killing 29 Muslims at prayer. Goldstein is beaten to death at the scene by survivors. 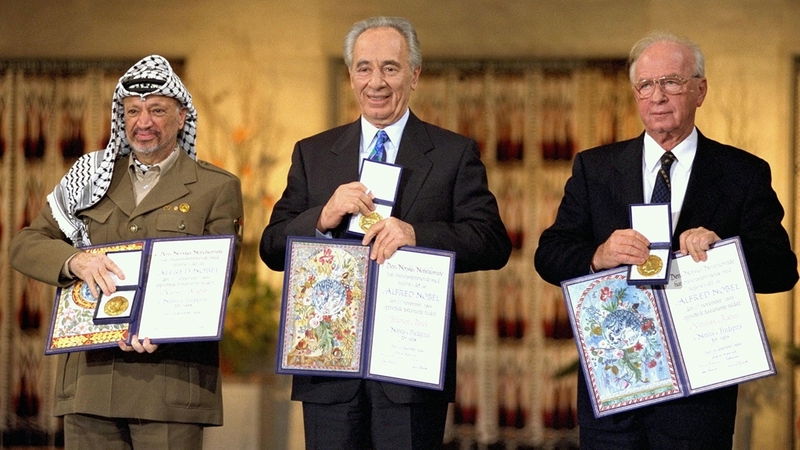 The Norwegian Nobel Committee announces it will award the 1994 Peace Prize jointly to Shimon Peres and Yitzhak Rabin of Israel and Palestinian leader Yasser Arafat. 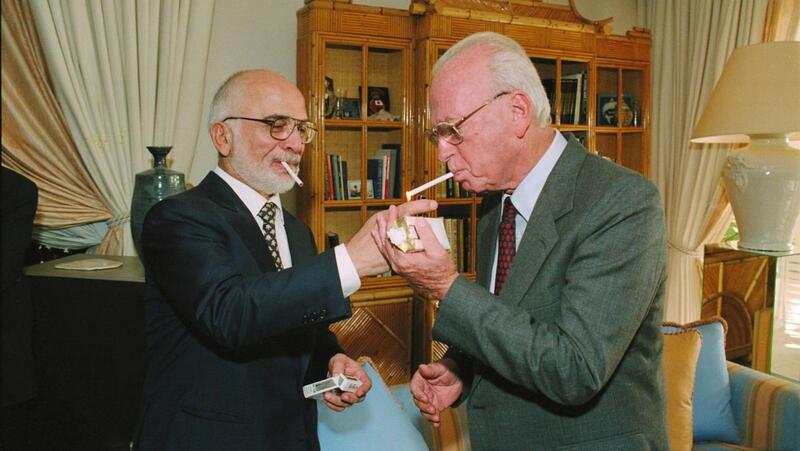 Israel and Jordan sign a peace treaty. Israeli Prime Minister Yitzhak Rabin is assassinated in Tel Aviv by an Israeli ultra-nationalist following an address at a peace rally. Shimon Peres takes over as prime minister and calls for early elections. A Palestinian suicide bomber blows up the Number 18 bus in central Jerusalem, killing 26 people. The same bus line is attacked again on March 3, resulting in 19 deaths. Combined with a third suicide attack in central Tel Aviv, the bombings prompt a severe military crackdown by Israel and erode public faith in the peace process. Benjamin Netanyahu narrowly wins the premiership over Shimon Peres, who held a commanding lead in the polls prior to a spate of deadly terrorist attacks in February and March. Two Israeli helicopters collide in the air over southern Lebanon, killing 73 Israeli soldiers in the worst air disaster in the country’s history. Israel completes the withdrawal of its troops from southern Lebanon, where it had maintained a security zone since 1985. Two weeks of negotiations between Israeli Prime Minister Ehud Barak and Palestinian leader Yasser Arafat at Camp David end without a peace agreement. Israeli opposition leader Ariel Sharon visits the Temple Mount in Jerusalem amid heavy security, sparking riots and protests that will eventually become known as the Second Intifada. Israeli Tourism Minister Rehavam Ze’evi is assassinated by Palestinian terrorists at a Jerusalem hotel. The Arab League, meeting in Beirut, unanimously adopts a peace initiative calling for Israeli withdrawal from Arab territories, a just solution to the Palestinian refugee problem and the establishment of a Palestinian state in exchange for recognition of Israel and full normalization of relations. Israel launches Operation Defensive Shield, a large-scale military incursion into the West Bank, and places Palestinian leader Yasser Arafat under siege in his compound in Ramallah. Israel approves the first phase of a West Bank security barrier. 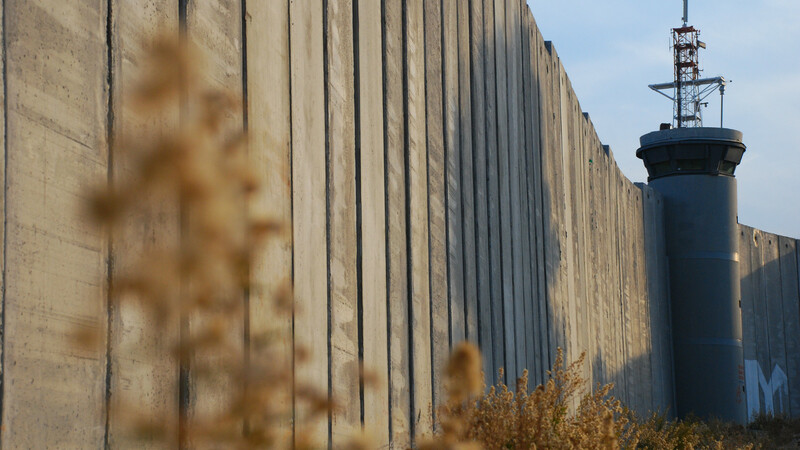 Palestinians describe it as an “apartheid wall” and a land grab, but Israel insists it’s a necessary and effective counterterrorism measure. 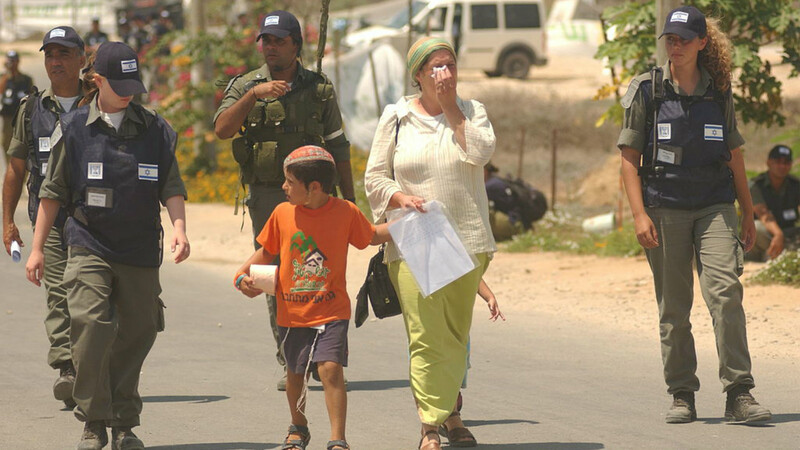 Israel commences the evacuation of all Israeli settlers from the Gaza Strip and the unilateral withdrawal from the coastal enclave. 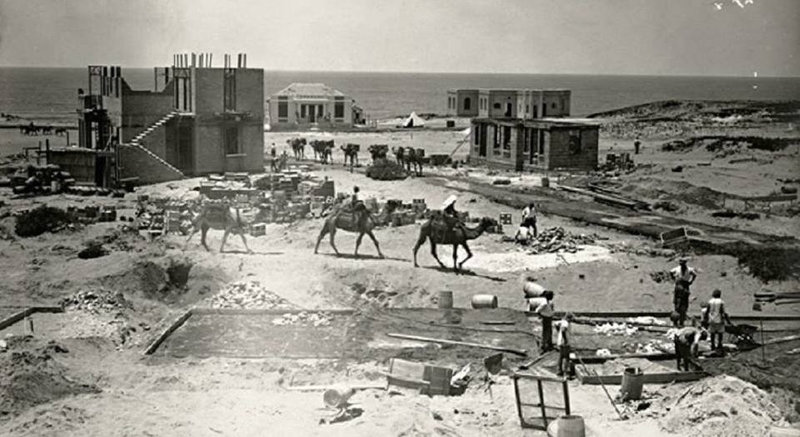 JTA ARCHIVE: Is Gaza Part of the Land of Israel? It Depends Who You Ask. The Second Lebanon War begins after Hezbollah operatives launch a cross-border attack, killing three Israeli soldiers and abducting two others. The long-simmering power struggle between the militant group Hamas and Palestinian Authority President Mahmoud Abbas’ Fatah faction breaks out into open battle in Gaza. The five days of fighting end with Abbas dissolving the Palestinian unity government and Hamas assuming total control of Gaza. Israel launches Operation Cast Lead, a three-week military campaign aimed at stopping Palestinian rocket fire from Gaza. 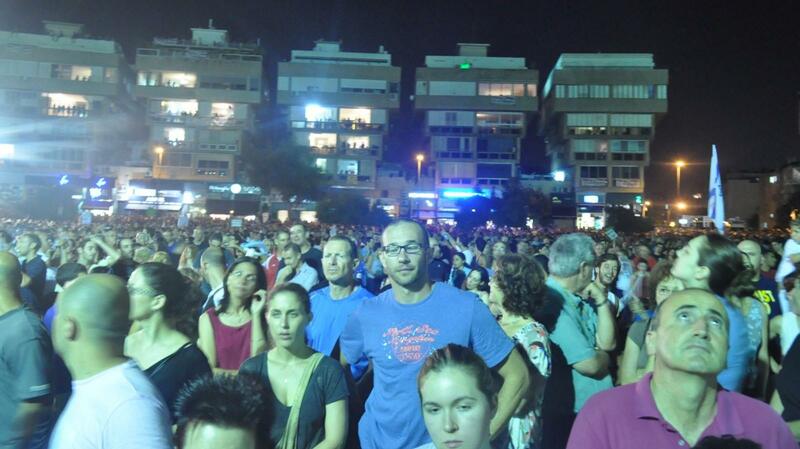 Demonstrations begin against the rising cost of living in Israel. The protests spread over the course of the summer, leading hundreds of thousands of Israelis into the streets in opposition to rising housing costs and growing economic inequality. JTA ARCHIVE: Just How Expensive Is It To Live in Israel? Israel launches Operation Pillar of Defense, an eight-day military campaign sparked by an intense round of rocket fire from Gaza aimed at Israeli civilians. Three Israeli teenagers are kidnapped in the West Bank, sparking a massive military operation to locate them. The remains of the three are located on June 30 in a field near Hebron. Israel launches Operation Protective Edge, a military campaign that includes a ground invasion aimed at destroying Palestinian tunnels used to smuggle weapons into the coastal enclave and launch attacks against Israel. A wave of Palestinian firebombing, car-ramming and stabbing attacks breaks out, mostly in the Jerusalem area, leading some to raise concerns that a Third Intifada, sometimes referred to as a “stabbing intifada,” is underway. Jewish extremists firebomb a Palestinian home in the village of Duma, killing 18-month-old Ali Dawabsheh and his parents. An Israeli Jew, Amiram Ben-Uliel, is later indicted for the murder, and an unnamed teenager is charged as an accomplice. For up-to-date news about Israel, visit our partner site JTA.